Inhibits growth of Herpes simplex virus. May help prevent associated infection. Lysine is an essential amino acid which cannot be produced by the body and must be ingested from the diet. It is concentrated in the muscles and has a number of biological functions. Amongst others, it plays a part in bone growth and in the formation of collagen and antibodies, as well as in carbohydrate metabolism. 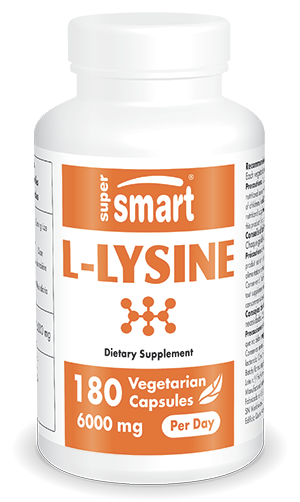 ¤ Lysine inhibits the spread of the Herpes simplex virus and can prevent resulting infections (cold-sores and genital herpes). Clinical studies investigating the effect of lysine on the herpes virus have been conducted on 229 subjects focusing mainly on labial herpes. The majority of studies suggest that it can help reduce recurrence and severity of attacks, and even accelerate healing in certain subjects. ¤ A preliminary trial indicates that lysine could help prevent osteoporosis by encouraging the body to assimilate and retain calcium. Combined with arginine, it may have an anti-anxiety effect by modifying stress-induced hormone responses. ¤ According to Linus Pauling and his colleague Mathias Rath, lysine supplementation, combined with vitamin C, may significantly, and rapidly, reduce atheromatous plaque. This combination prevents lipoproteins (a) and (b) from accumulating on artery walls and dissolves existing plaque, gradually reintegrating it into the blood. Some studies suggest that lysine may also help counter fatigue, an effect potentially related to its role as a precursor of carnitine, a fat-burning and energy-stimulating compound. As such, lysine may have a beneficial effect prior to participating in physical activity. Another amino acid, glutamine, may also be of interest in aiding post-exercise recovery.